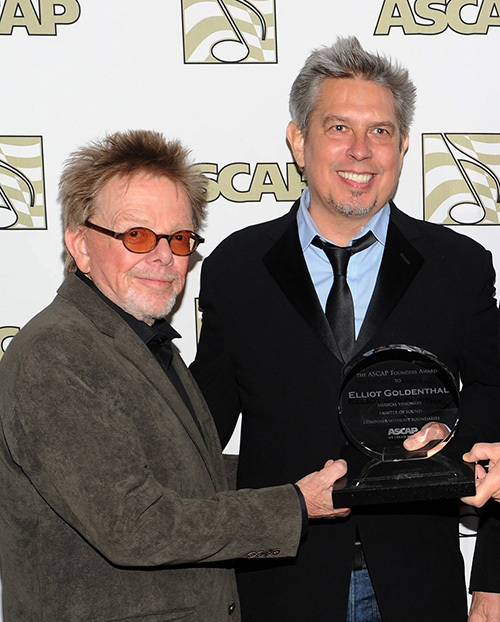 BEVERLY HILLS, Calif.—Elliot Goldenthal received the Founders Award, and Deborah Lurie the Shirley Walker Award, at Monday night 's annual Film and Television Music Awards presented by the American Society of Composers, Authors and Publishers (ASCAP) at the Beverly Hilton Hotel. Goldenthal, who won an Oscar for Frida and has composed such other film scores as Alien 3, Interview With the Vampire, Batman Forever, Heat and Titus, was honored not only for his film music but for a diverse career that also includes music for the theatre, ballet, opera and the concert hall. ASCAP president Paul Williams called him "a restlessly creative singular spirit," and longtime partner Julie Taymor added (via video clip) that he was "one of the most versatile artists I will ever know." Director Michael Mann, who worked with Goldenthal on Heat and Public Enemies, said the composer's music "opens additional dimensions" and cited his "raw genius and intensity." Goldenthal, who said he is preparing his ballet Othello for a May performance by the American Ballet Theatre at New York's Metropolitan Opera, remarked that "you approach every project with zeal, hope and conviction. My job is to see the director's vision and be part of a vast whole." Lurie (the composer of Safe Haven, Dear John, An Unfinished Life and One for the Money) was praised by director Joss Whedon who (in another video clip) called her "a maverick and a delight," and by director Joe Nussbaum, who termed her "a filmmaker's composer" and quipped that "if Debbie scored your life, it would be so much better." Paramount music president Randy Spendlove said that, after meeting her, "she quickly became my secret weapon... she's a true genius." In her acceptance speech, Lurie addressed the currently hot topic of the few women film composers in Hollywood: "Tonight I'm so proud to be part of the ASCAP way of addressing the issue, which is to celebrate the successes, and to give women like me who love their career a chance to say, 'come join me.' If we want more women film composers, we need more aspiring women film composers. That comes from making it look like a great idea and not a political issue." 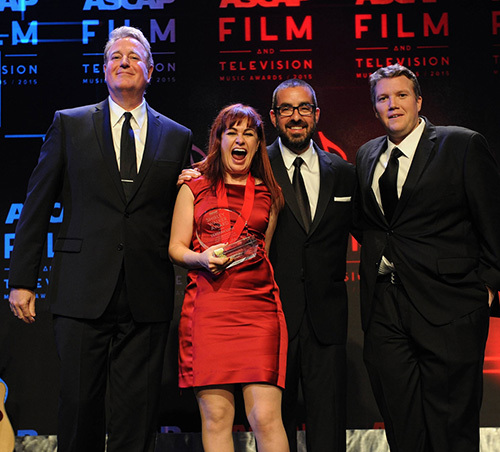 This year's ASCAP Composers' Choice Awards, voted by the composers themselves, were Austin Wintory (The Banner Saga) for video game score of the year; Sean Callery (Elementary, Homeland, Bones), television composer of the year; and Johann Johannsson (The Theory of Everything), film score of the year. 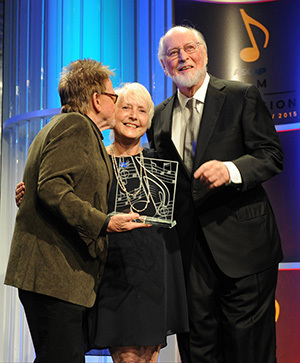 Renowned composer John Williams was a surprise guest, honoring longtime ASCAP executive Nancy Knutsen (formerly senior vice president of film and television repertory, now a special consultant for film and television music). Both received standing ovations from the crowd. Williams cited her "remarkable contributions" to ASCAP, calling her "my favorite little Ewok and a very great lady." Among winners in attendance were Bear McCreary, who picked up multiple honors for TV's Black Sails, Defiance, Agents of S.H.I.E.L.D., Outlander and The Walking Dead; James Levine, for American Horror Story, Royal Pains and The Last Ship; David Vanacore, for Big Brother, Undercover Boss and two Survivor series; and Gabriel Mann, for Modern Family, Friends With Better Lives and The McCarthys. Shawn Patterson performed his recent Oscar-nominated song "Everything Is Awesome" from The Lego Movie; and Curtis Stigers, Dave Kushner and Bob Thiele Jr. performed their theme for TV's Sons of Anarchy. A first-rate jazz combo also did pieces from Goldenthal's film scores for Cobb and A Time to Kill. Paul Williams announced that ASCAP's 2014 revenues topped $1 billion, the first time ever for a performing-rights society.